Ever wonder what to do with those week old Valentine's Day flowers? If you are like me, you may put so much hope into one thing that you don't know when to let go. It could be something deep and personal for you, but for me, it's usually plants. I am such a plant mom and want every baby to survive.... even the week old Valentine's Day flowers my sweet boyfriend got me! Ridiculous, I know. I like beauty and do not want to waste it! 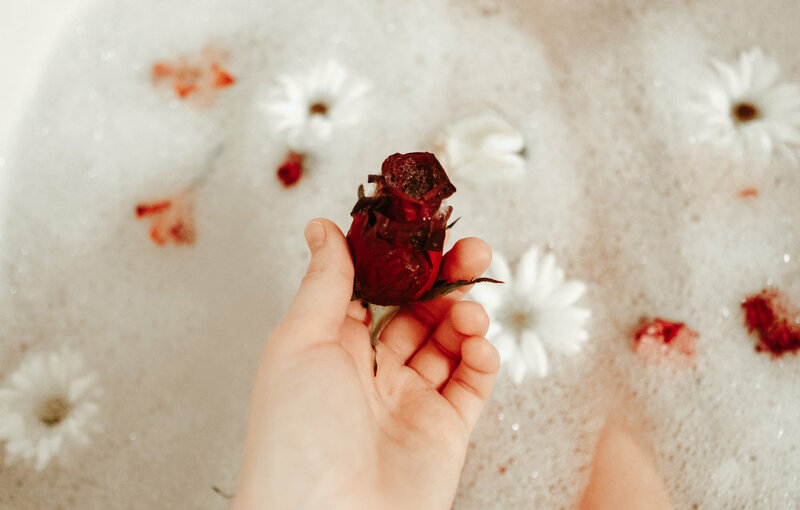 So instead of watching your flowers wither away, try to put them to good use and indulge yourself in a relaxing bath with clippings from your bouquet. Tonight, I ran myself my daily bubble bath and added a few clippings (avoid flowers with lots of seeds... way too messy) to make it pretty and peaceful. As I listened to my favorite Spotify playlist (muse sick), I reviewed a set of flashcards for an exam I have coming up then soaked all my worries away. Next, I plan to preserve the rest of my bouquet with a flower press kit I got for Christmas! Should I blog the results?